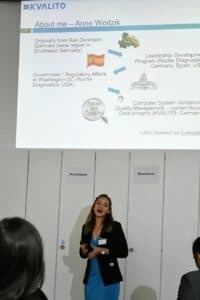 Anne Woitzik has multiple years of cross-functional, international Quality Management and Regulatory Affairs experience within the Pharmaceutical and Medical Device industry for major life science companies (Roche, Fresenius, Boehringer Ingelheim). Due to her experience in Data Integrity and previous collaboration with the FDA during her time in the Government Affairs team at Roche in Washington DC, she is currently consulting the Drug Substance Manufacturing unit of one of the world’s leading Pharmaceutical companies to comply with international regulatory Data Integrity requirements. Anne’s global work experience in the United States, Germany, Italy and Poland enable her to excel in a multicultural environment. Working across cultures within the healthcare industry has provided her with keen insights and an understanding to communicate not only in different languages but also to understand different cultures and to act accordingly. Anne holds a BA degree in International Business. If you would like to join this Data Integrity Breakfast, please send us a confirmation via e-mail to contact@kvalito.ch. Please note that participation is limited to 15 persons.